Circular outline. Circular discus has relief of rosette with 14 petals with rims and a narrow, rounded framing ring. Narrow, steeply sloping to rounded shoulder with circles flanking handle. Large ring handle with two lateral grooves attaches at discus rim and part way down back wall. Fabric: 5YR 7/6, reddish yellow. Slip: 10R 5/8, red. Soft, somewhat fine fabric has uncommon, small, subangular, white (calcitic) and black inclusions and rare flecks of golden mica. 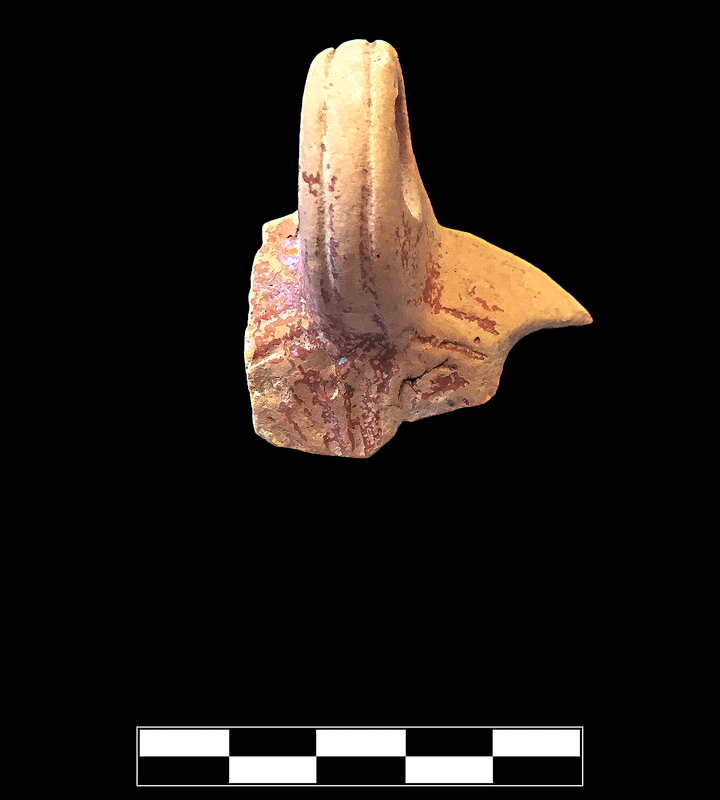 One large fragment preserves small part of discus, shoulder, and entire handle. Heavy, extensive abrasion; rare specks of encrustation.